Revolutionary Sonic Boiler Probably Not A Scam! Tell us about this thing please. Can there be that much transfer of energy so quickly? Well, we don't really know how quickly Peter Davey's "sonic boiler" is supposed to be working. The article says it boils the water "within seconds", which is a bit of a fuzzy definition. I'd like to see exactly how fast it actually does boil it. And if you want to transfer energy to a liquid, hitting the resonant frequency of that amount of liquid in that container is actually not a good way to do it. That'll just spray water up the walls. And talk of "resonances" is of course practically diagnostic of crackpottery. But, making the usual allowances for scientific illiteracy in the popular press, it's possible that someone could have come up with a way to dump energy into water faster than your normal immersed heating element can do it. Immersed elements are already pretty darn good, though. The "2200-2400W" electric jug in my kitchen will bring half a litre of water to a good enthusiastic boil in about eighty seconds, and it draws as much power as you can get from the maximum ten-amp-per-socket current rating of 220-240V countries like Australia and New Zealand, where this inventor resides. The sonic boiler could be running at 15 amps or more, but that's cheating; 15-amp sockets are special equipment (used for things like air conditioners), and anybody can boil tons of water in half a second if they're allowed to use as much electricity as they like. About 500ml is the minimum amount you can put in most electric jugs without leaving some of the heating element hanging in the air to overheat. It's also two mugs worth of liquid. So, as Peter Davey says, people certainly do often boil more water than they need. But making an electric jug of conventional design that can heat one mug worth of liquid is not a great engineering challenge. Let's do the sums and see how fast such a jug could perform, in Physics Experiment Land where pulleys have no friction and cows are spherical. The (physics, rather than dietary) calorie is the amount of thermal energy necessary to raise the temperature of one gram of water by one Celsius degree. So if you start with 250 millilitres of water at 25°C (which means almost exactly 250 grams of it) and need to raise it all to 100°C, you need 75*250=18,750 calories, which is 78,450 joules. A joule is a watt-second. So if you've got a 2400-watt heater that transfers heat with perfect efficiency to water, you must run it for 32.7 seconds to do this job. Taking that into account, my electric jug is, clearly, not that far from the theoretical maximum water-heating efficiency. Assuming its element could be fully submerged in only 250ml of water, that water would boil in about forty seconds, which is only 1.22 times the Physics Experiment Land time for the job. Given that the element has to heat up from the inside out, and that some energy is lost through the walls of the jug, and that some more is lost to internal evaporation and sound and so on, this electric jug is clearly working about as well as it even theoretically could, when you take real-world limitations into account. Some other 2400-watt heater, built in such a way as to be less limited, could only possibly do the job in 82% of the time, unless it was magically getting energy from nowhere. And Peter Davey does not appear to be making any such claims. So I say good luck to this bloke. He may well have come up with a genuinely new and interesting heater element design, which may have advantages over existing bare immersible heaters, which are generally rather dangerous things. And his heater may work very nicely with even small amounts of water, which in itself is a step forward; you can get electric kettles with the element built into the baseplate which work with arbitrarily small amounts of water, but they take longer to heat up in the first place because of all the extra metal around the element. There may indeed be a niche for this sonic heater, if it performs as advertised. But there ain't no such thing as a free lunch. If the sonic heater works very much faster, in seconds-per-gram terms, than any old discount-store electric jug, then it's another perpetual motion machine, which would have a few applications beyond just making a quick cup of tea. Well, the picture doesn't give any indication of a pressure vessel, and a device that lowered the air pressure in an unsealed container filled with water would act as a straw and draw the water out. The thing about resonance is that its main useful property in an application such as this would be to transmit mechanical energy- and given that converting electrical energy to mechanical energy is not as efficient as converting electrical energy to thermal energy, then even if your mechanical->thermal conversion is 100% efficient, you've used more energy than you would if you converted electrical energy directly to thermal energy, which is bloody close to 100% efficient as it is. Unless there's something weird like sonoluminescence going on (possible I guess) I can't see how this is more effective than an straight resistive element job. Out of curiosity... what's the energy coupling like of a microwave oven? Does a 1000W microwave heat up water as fast as a 1000W kettle would? I'm assuming that the 1000W lable is the power available within the cooking area, as the magnatron is hardly 100% efficient. About your water heating math...been along time since I was in high school chemistry, but isn't getting water to the boiling temperature the easy part of boiling? I seem to recall that there's a "transition energy" you need to pump in to actually make the transition from very hot water to steam. I wonder if this device includes one of those ultrasonic transducers that atomize water like those "cool mist" vaporizers. You turn it on and the water immediately starts bubbling and you get a mist out of it. The water isn't getting any warmer, but you get the illusion of boiling. 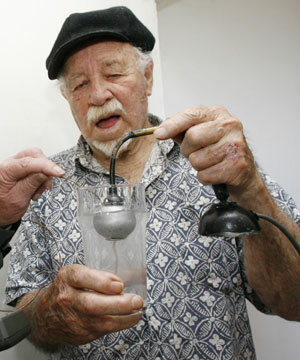 The fact that the inventor is using his bare hands to hold the glass of boiling water gives me pause. Even though glass is, in general, a good insulator, it isn't that good. So, take the ultrasonic transducer out of a vaporizer, add a traditional resistive heating element, and you get a device that makes water appear to boil right away, and you can stall any skeptics until the regular heating element actually heats the water. One other thought came to mind: a small-scale reverse-cycle air conditioner, which has been mentioned by Dan on several occasions. Assuming you could get the dimensions of such a device small enough, you could put a whole lot more power into the water than just the energy from the wall socket. You can see in the picture that the person just out of the shot is holding a temp probe in the water. So I doubt he'd be fooled by simulated boiling. Well, he does mention sonics and heat pumps are great for cheating thermodynamics - maybe he has built a very small thermoacoustic heater. If you squint hard enough that bulb might even be a Helmholtz resonator - although I am not sure that such would be useful in this application. If the device is a mini-heat pump (rather than an immersion heating element that does not need to be fully submerged) then that is a terrific achievement - whatever the technology. Actually, no this is not really that new. This technology and immersion ultrasound horns/plates/cups are already used by many researchers in the fields of chemistry/physics/health. However, it will never be used for this reason, there is no way. Look up Sonochemistry in google. Back to the drawingboard... or your day job. Interesting but bad idea. Oh I forgot to add....Depending on the frequency the temperature of the bulk solution and the temperature of the solution during ultrasound could be different. Also, it doesn't take much energy to get the "boiling" effect you see when ultrasound is induced on an aqueous medium. Less than 10W. Assuming they mean a glass of water, it sounds like it's no faster than your jug. No magic here.